Barbara Kruzel (nee Hooton), age 82, a resident of Naperville, IL since 2005, formerly of Chicago's South Suburbs, passed away peacefully on Tuesday, March 26, 2019 at Edward Hospital in Naperville surround by her loving family. She was born November 22, 1936 in Chicago, IL. Beloved wife of the late Raymond Kruzel, who preceded her in death on September 15, 1987, loving mother of Mary (Ken) Bettis, Jo (Steve) Malik and the late Anna Pedersen, adored grandmother of James (Kelly) Gardner and Joseph (Sarah) Malik, cherished great-grandmother of Analissa and Kyle Gardner and Sterling Malik, devoted daughter of the late James and Virginia (nee Downes) Hooton, dear sister of Mary "Cis" (the late Dave) Fagan, the late James “Buddy” Hooton, the late Dale James Hooton and the late Russ (Midge) Hooton, fond aunt, great-aunt and friend to many especially Bill W.
Barbara grew up on Chicago's South Side. A loving homemaker, she later became a licensed chemical dependency counselor at The South Suburban Council on Alcoholism and Substance Abuse in Hazel Crest, IL. 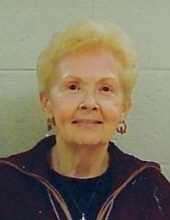 Barbara was a former resident of Tabor Hills in Naperville. A devout and faithful Catholic, Barbara was a member and lay minister at St. Raphael Catholic Church in Naperville and St. Anne’s Parish in Hazelcrest. Visitation will be held Saturday, March 30, 2019, 8:00 - 10:00 AM at Friedrich-Jones Funeral Home & Cremation Services, 44 S. Mill St., Naperville, IL. Services will begin Saturday, 10:00 AM from the funeral home and will proceed to a 10:30 AM Mass of Christian Burial at St. Raphael Catholic Church, 1215 Modaff Rd., Naperville, IL. Interment will follow at Resurrection Cemetery, Justice, IL. To send flowers or a remembrance gift to the family of Barbara H. Kruzel, please visit our Tribute Store. "Email Address" would like to share the life celebration of Barbara H. Kruzel. Click on the "link" to go to share a favorite memory or leave a condolence message for the family.